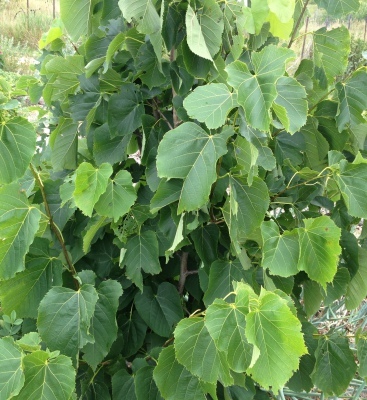 This native tree provides abundant crops of excellent edible leaves from spring through early summer: when they’re just leafing out and still young and tender they make an excellent, sweet salad leaf that can be used in bulk quantities. It can be coppiced (cut in winter and allowed to re-sprout) every few years to keep it a manageable size and to keep the leaves within picking height. The flowers can be used to make a nice tea, and the bees love them. Basswood honey is a sought-after delicacy. This is becoming one of our favourite salad plants, and we’ve recently planted some more so we can have loads of delicious, lettuce-like leaves with very little maintenance. They make very attractive coppiced landscape features, too.